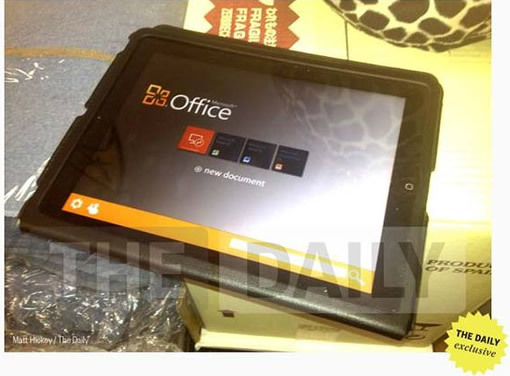 Microsoft Office for iPad images leaked few months ago suggesting that Microsoft Office for iPad could launch soon. The Daily published this information at that time, but Microsoft denied the report but The Daily stood by the report. Now BGR is reporting that Microsoft is working on both Android and iOS versions of the Office suite. According to BGR Microsoft Office for Android and iOS might launch by November. Office suite hugely popular on the desktops is almost absent on the tablets and smartphones. Apple dominates the tablet market with iPad and it is natural to think that Microsoft doesn’t want to miss this opportunity to put Office on iOS devices. Office has been a cash cow for Microsoft. BGR’s source has reportedly seen the iOS version of the Office suite and is identical to the leaked image we have seen before. The loading screen in the app clearly said “Office for iOS” instead of Office for iPad, that means Office for iPhone and iPod devices will also be available along with Office for iPad. Microsoft might think to promote its Office suite on Windows 8 tablets and Windows phone devices, but Windows 8 tablets are not yet in the market and Windows phone is not a success so far compared to Android and iOS. Android and iOS rule the smartphone and tablet market, so it makes perfect sense that Microsoft might want to release Office for both these platforms. If at all released Microsoft Office for Android and iOS would be welcome, and coupled with SkyDrive you could access and edit office files on your smartphone and desktop PC and keep them in sync.